Check out the blogpost on Outcropedia, a digital repository for field-based online activities. What a great resource for taking virtual field trips! Today, I’m spending most of the day packing rocks, field equipment, and personal belongings in order to get ready to fly out of Salt Lake City tomorrow. Leaving Ephriam most summers is often bittersweet. I’m excited to get back to Wooster to begin analyzing all of the data that was collected this summer. However, I am also amazed that the 6 weeks out here has come to an end so soon. Hiking all day long while mapping and collecting data for stratigraphic and structural projects is good for my soul and always works to rejuvenate me as a geologist. So, naturally, a part of me wants to remain out here and continue to explore the geology of central Utah, a region of geologic complexity and intrigue. Responsibilities in Wooster await, and I’m sure that Phil and Bill are as eager as I am to begin sifting through their Senior I.S. data. Wooster, here I come!! Gunnison Plateau, Utah. July 26. Phil and Bill both left Utah a few days ago, with Phil flying to visit family in Colorado and Bill continuing his WooCorps job. So, I have a few days to myself to do some reconnaissance work for future I.S. projects for students and research projects for myself. I headed off to Rock and Dry Canyons with the OSU field camp. Although that was the area for their final mapping project, Terry Wilson (OSU’s structural geologist and field camp director) put me to work using my Brunton for the day. Both she and I had previously spent quite a bit of time measuring joints, veins, and stylolites at Rock and Dry for a structural analysis of the area, but a few days earlier, she came across some additional structural features. I spent a day out in the field measuring in order to determine if this would be a worthwhile addition to the structural research we already completed in the area. 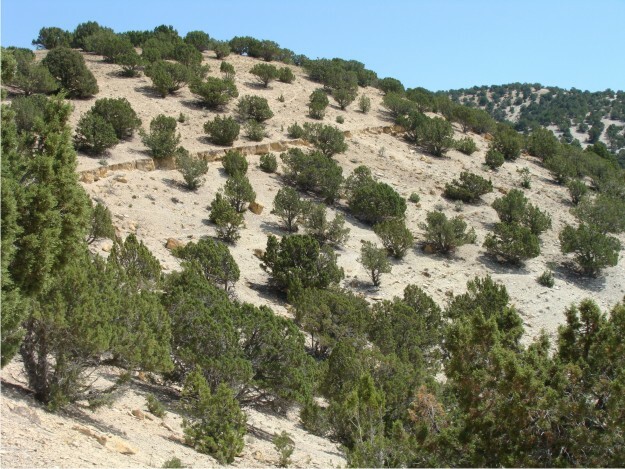 Here is a view of the north-facing slope in Dry Canyon. 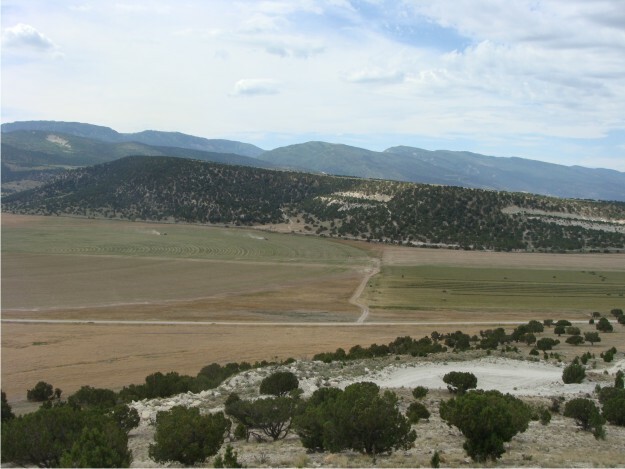 If you look closely, you can see the Flagstaff Limestone outlining the presence of a monocline in the area. The above photo illustrates one of the conjugate vein sets that I spent the day measuring in the Jurassic Twist Gulch Formation. Measuring these conjugate vein sets perhaps next summer would add to our structural interpretation of the area. 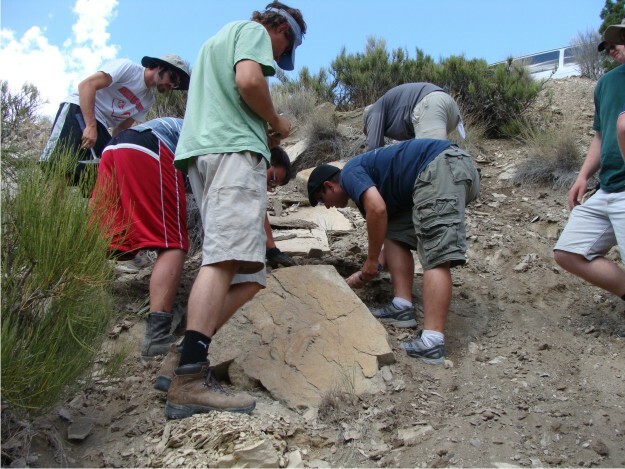 While out at Rock and Dry Canyons, Terry stumbled upon a gorgeous vertebrate jaw embedded in a rather large block of the Colton Formation. 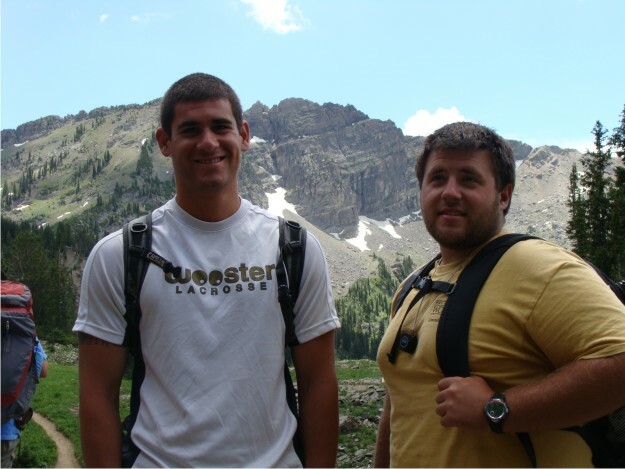 So, the next day, we set out on “Operation Fossil Find”, the mission coined by one of the OSU TAs, Jason Kabbes. A group of us drove back to Rock and Dry Canyons, and the excavation began. 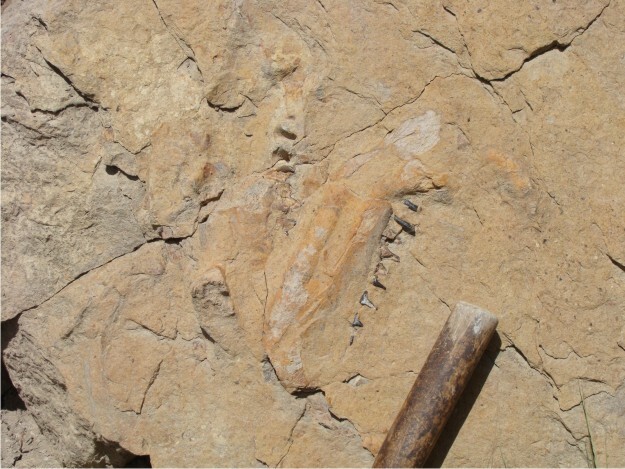 The photo above is the jaw that was found in the Colton Formation. None of us out here are paleontologists, so naturally, we are still trying to identify the find. 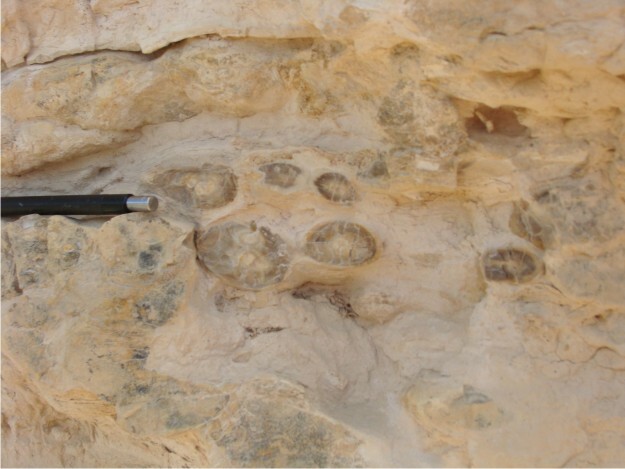 By far, Terry's discovery is the best fossil that I've seen in the Colton Formation. Operation Fossil Find team members are trying to strategize how best to remove the jaw and vertebrate bones. All we had as tools were our trusty rock hammers and a 1/4 inch chisel. But, the guys successfully removed the jaw from a piece of float, and it is now sitting in our Ephraim apartment, awaiting identification. Near Salt Lake City, Utah. Research Day 13 (July 22). The Ohio State field camp was going on a day trip to see some great geology near Salt Lake City, so the Wooster gang decide to join them once again. Last field trip, we had a singular focus: to study the thrust sheets associated with the Sevier Orogeny. However, this field trip was different, because the goal was to see as much geology in the Salt Lake City region as was humanly possible in one day. And, 14 hours later, we succeeded in seeing a spectacular landslide, an impressive intrusion, one of the largest open pit mines in the world, and the famous Wasatch Fault. View of the 1983 Thistle landslide, which has a depth of 60 m and initially blocked the canyon and associated Spanish Fork River. The costs to "correct" damage caused by the landslide approached ~$200 million. 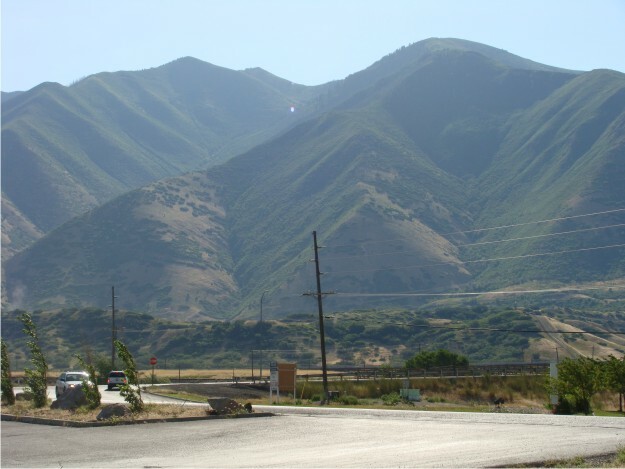 After the Thistle landslide, we headed toward Spanish Fork, Utah, where triangular facets are exposed along this segment of the Wasatch Fault at the mouth of the canyon. Phil and Bill seemed to enjoy Albion Basin, which was our next stop of the day. Albion Basin, at the head of Little Cottonwood Canyon, is the location of exposures of the Alta stock. The stock, a granodiorite, was intruded into sedimentary rocks in the area. 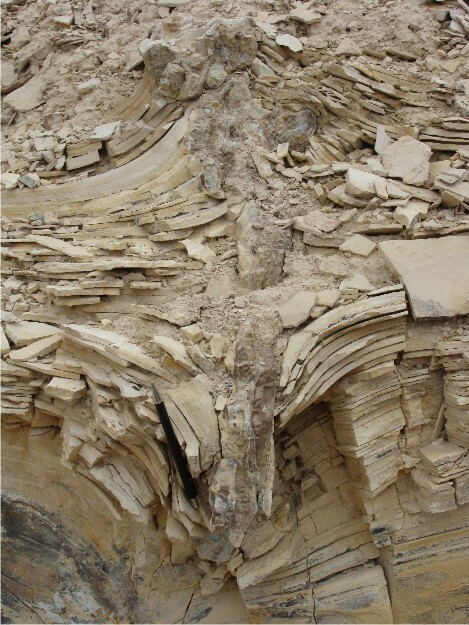 As a result, there is evidence for contact metamorphism that can be mapped from unique mineral assemblages. After driving down from the Albion Basin, we stopped at the mouth of Little Cottonwood Canyon to view the glaciated U-shaped valley. 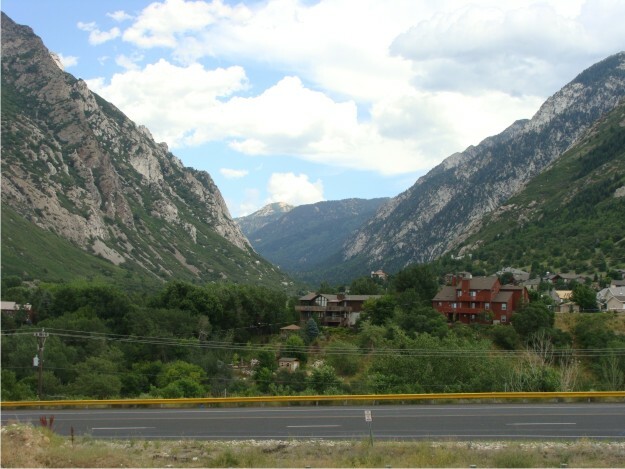 Believe it or not, the view at the mouth of Little Cottonwood Canyon is accessible from a "geologic view park". 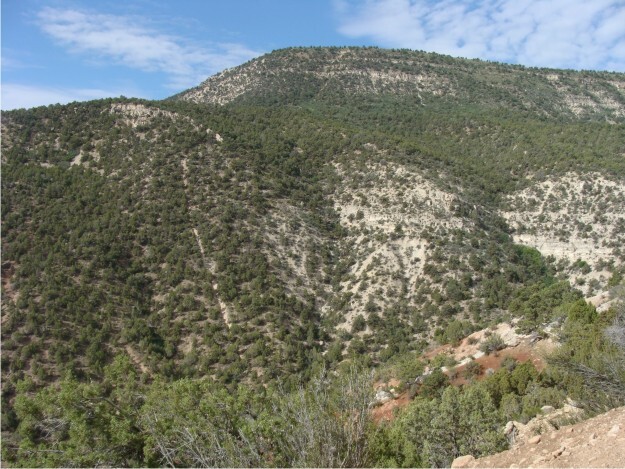 Land at the mouth of the canyon was donated, and a series of educational signposts describe the bedrock geology, regional glaciation, the Wasatch Fault, and the terraces of Lake Bonneville. Bill and Phil are shown at the geologic view park relaxing and waiting for us to go to our next stop. 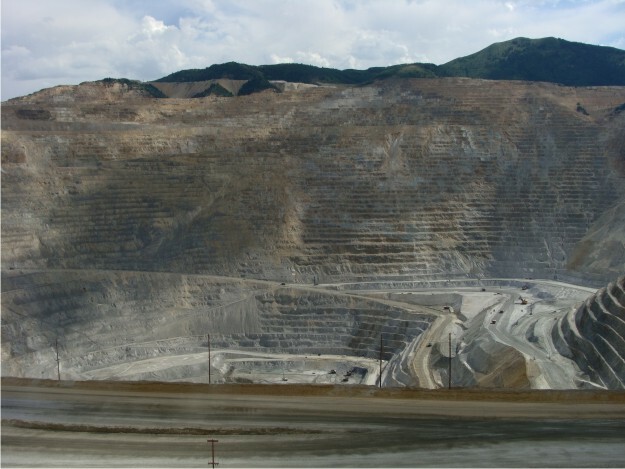 Our next stop was the famous Bingham Canyon Copper Mine, where copper, molybdenum, gold, and silver (just to mention a few) are mined daily. We were able to tour the visitor's center, watch a short video on Kennecott Copper's mining operations, and spend some time peering down into Earth's largest man-made excavation. For our last stop of the day, the group invaded someone's backyard to look at one of the best exposures of the Wasatch Fault in the Provo area. 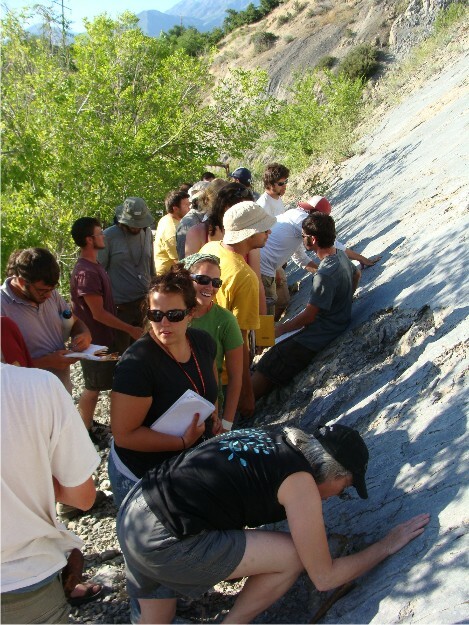 In this photo, we are all huddled at the fault surface, examining slickenlines, slickenfibers, and fault breccia. Luckily, I was able to collect several samples to use as test specimens for this year's structure exams! The Woo crew in front of one of the larger cedars we found. Today we took a skiff over to Pleasant Island to core some older cedars. Our guide and captain for the day was Wayne, an archeologist in the area. We found many huge and old cedar trees after a relatively easy hike to the site. Colin managed to get many cores to bolster his chronology for his IS. Dr. Wiles and Wayne help secure the skiff after landing on Pleasant Island. Wayne looks on as Dr. Wiles and Kelly core a large, old and dead cedar. The cedar remain standing long after death. Also interesting was a dendroarchaeological point of interest: we found several cedar that had their bark stripped by (we think) the Tlingit. Colin’s careful analysis will help us to know the year it was stripped for sure. A dead yellow cedar that has had its bark stripped. Wayne thinks the markings were likely made by an adze. Black Hill, north of Ephraim, Utah. Research Day 12 (July 21). Today was our last day collecting data in the Green River Formation, so we ended it by visiting one of the larger quarries in the area. Shortly after arriving at the quarry, though, Bill stumbled upon a baby rattlesnake, and it was angry, curled up and rattling under a small wackestone ledge. Bill couldn’t quite leave it alone the entire time we were at the quarry. This rattlesnake only added to the “wildlife” list that we saw in central Utah while hiking through the Green River Formation. It seemed like each day numerous Black Widow spiders were seen, and some of them were fairly large. In addition to rattlesnakes and Black Widows, we were treated to cottontail rabbits, deer, elk, ground squirrels, swarms of “Mormon crickets” (migratory grasshoppers), red harvester ants, and a rare fox sighting in the middle of one afternoon. Phil turned out to be a "stratigraphic column machine", and here is completing a stratigraphic column through one portion of the largest quarry on Black Hill. The Black Hill quarry proved interesting, because it was unlike its northerly counterpart on White Hill. For example, the stromatolites here are much smaller than those that we observed on White Hill. Our initial assumption is that the Black Hill quarry is stratigraphically younger than most of the quarries on White Hill. 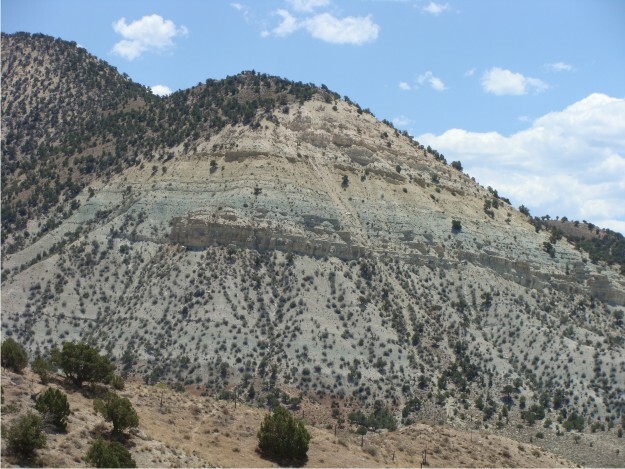 One feature that remained a constant within the Green River Formation was the presence of iron-rich layers that were used in correlation. On Black Hill, these iron-rich layers were more numerous and sometimes thicker. 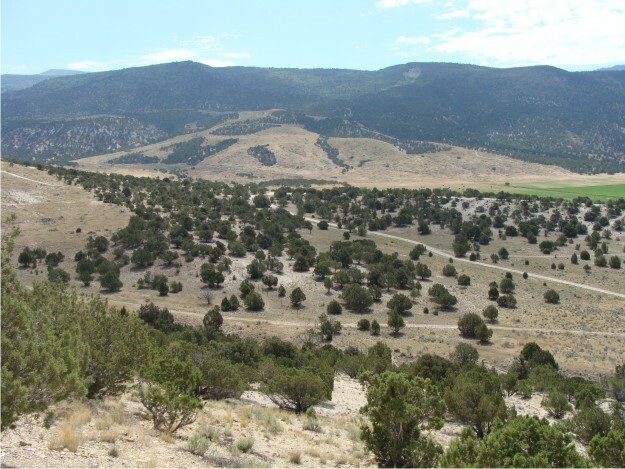 Little Hill and Black Hill, north of Ephraim, Utah. Research Day 11 (July 20). Today we set off with the same goal as we did on July 14 — mapping the large tuff bed with the GPS. So, it is the same procedure as last time, with Bill becoming a Human Antennae. 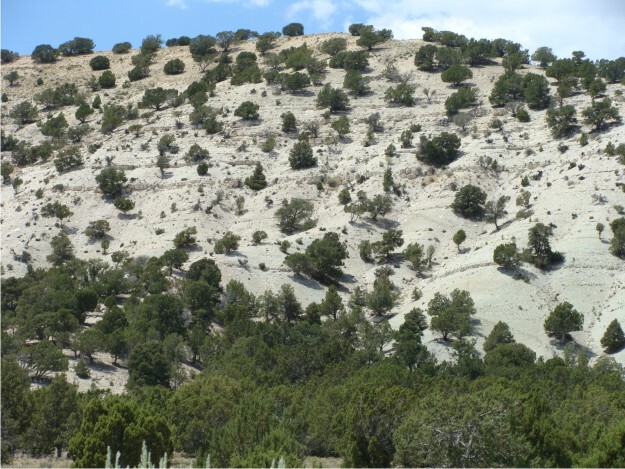 This time, however, we are headed to the Little Hill / Black Hill cuesta complex, which is south of White Hill (where we mapped the tuff before). The weather was again beautiful today, with temperatures in the afternoon fluctuating between 99-102 F…a simply perfect day for walking out the tuff bed all day long. View to the S of the Black Hill cuesta, with the Wasatch Plateau rising in the background. 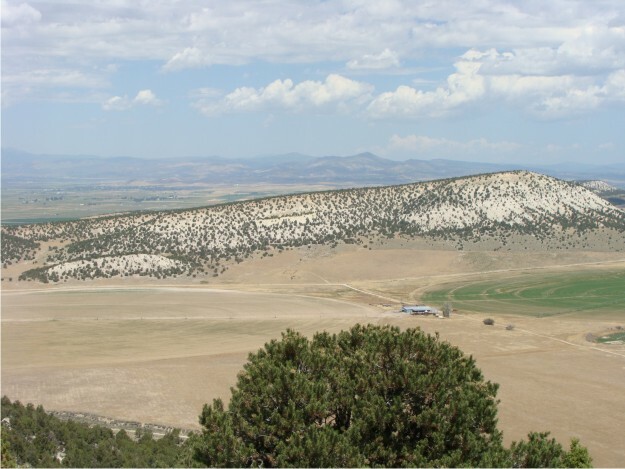 Black Hill is geographically larger than White Hill, but it is only slightly higher, with an elevation of 6,402 ft. Black Hill's perfect dip slope of the Green River Formation is shown off in this photo. Walking the tuff bed is not difficult at Black Hill, because the tuff was well exposed. 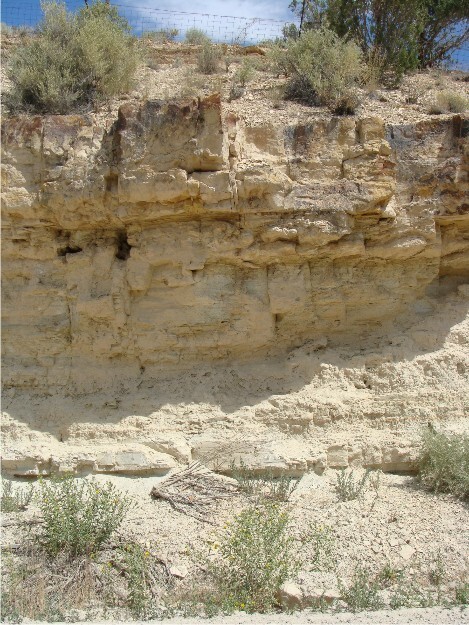 In this photo the resistant tuff bed is exposed along the Green River slopewash. The view from the top of Black Hill was amazing, and it provided a perfect location to take a picture of White Hill, which lies immediately to the N.
From the top of Black Hill, you can easily see the large landslide to the E. The landslide originated toward the top of the Wasatch Plateau and spread into the adjacent Cane Valley. Ephraim, Utah. Research Day 10 (July 19). Just a few blocks from where we are staying is a tame elk farm, whose southern border is a very small hill called Gal Hill. As soon as we drove by the hill, we knew that we had hit the jackpot. 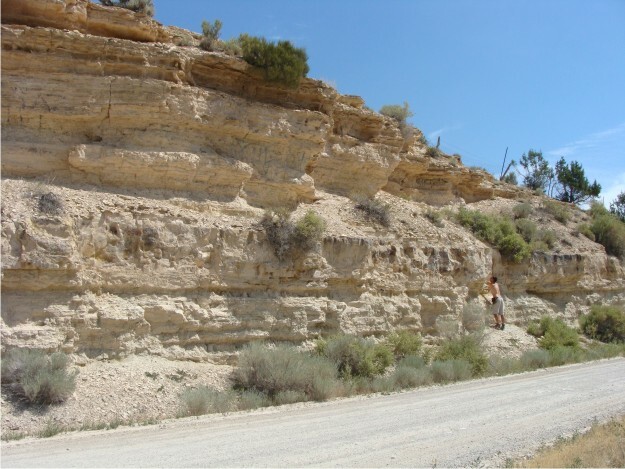 Most all other exposures of the uppermost large tuff in the Green River are covered by slopewash, but Gal Hill exposes the stratigraphy both below and above the large tuff bed that Bill was mapping in the region with GPS. We decided to spend the greater part of a day at Gal Hill, hoping that it might provide clues to changing lake conditions and facies migrations due to the influx of the tuff. Scenic overview of Gal Hill, a small hill on edge of Ephraim. 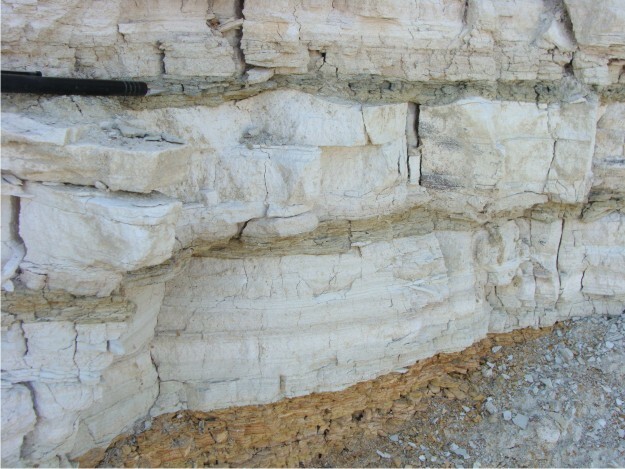 In the center of the photo, the larger ledge is the resistant tuff. Closer view of the tuff at Gal Hill. 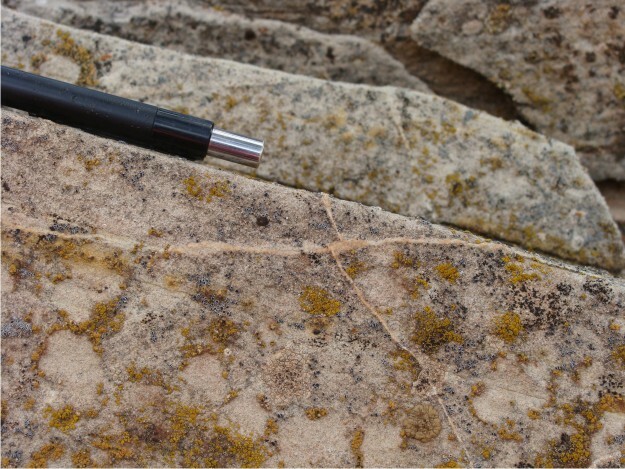 At this locality, the tuff is much more planar that at other localities, and it appears to maintain a constant thickness throughout. 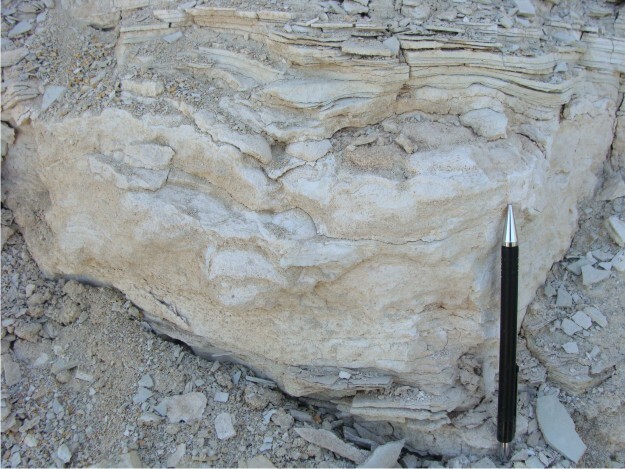 Immediately below the tuff bed is a zone of silicified stromatolites, some of which have been slightly deformed. 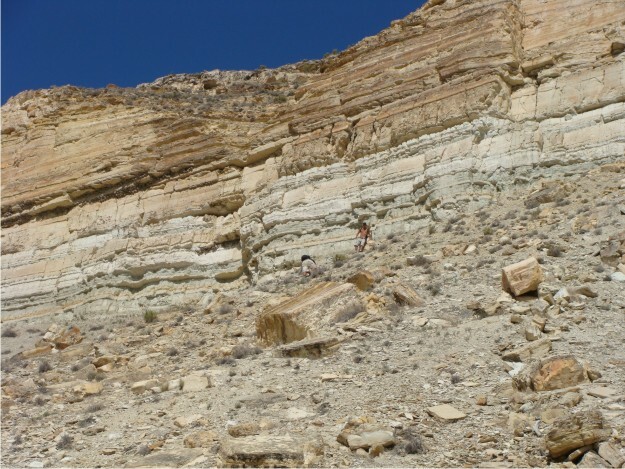 Above the tuff bed, the silica content of the Green River Formation seems to increase, with a variety of chert lenses, concretions, and thin chert beds of various colors. 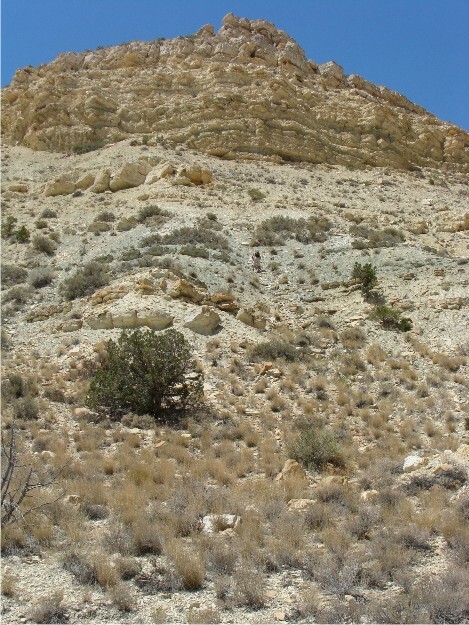 At the top of Gal Hill, the Green River Formation has been bent both downward and upward and fractured, separated by vertical chert lenses. Manti, Salina, and Gunnison, Utah. Research Days 8-9 (July 17-18). After finishing White Hill yesterday, we decided to spend part of the day (July 17) collecting more data and part of the day doing field reconnaissance for additional exposures of the Green River Formation that might help us with our research. 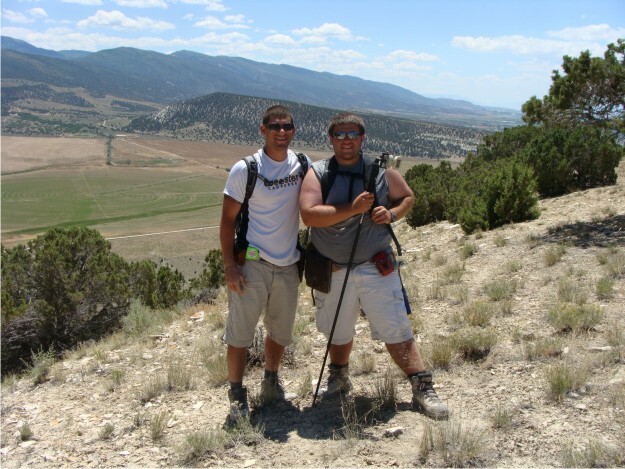 In the morning, we traveled to Manti, Utah, which is approximately 10 miles south of Ephraim. Manti is home to the Manti Temple, one of the Mormon temples in Utah. 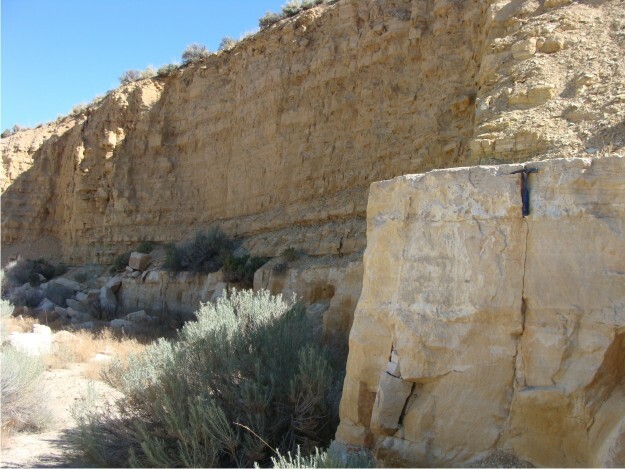 Interesting to geologists, though, is the fact that the Manti Temple is built out of the Green River Formation, and there is a large quarry in the hill immediately east of the Temple. “Temple Hill” provided a good exposure of the more massive quarry bed. View of the quarry at Temple Hill. The more massive quarry bed is approximately 8 ft thick here, and it is overlain by a succession of lime mudstones, wackestones, claystones, and shales. 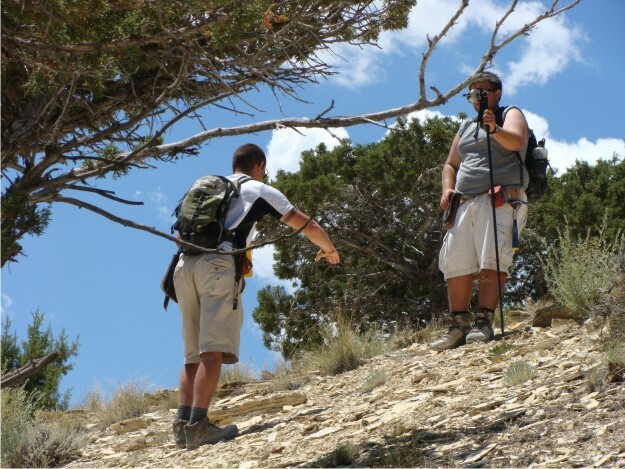 Phil and Bill are working their way through Temple Hill's stratigraphy. After our adventures on Temple Hill, we headed south for Salina, Utah, home of Soldier Canyon. This scenic view of Soldier Canyon shows the thickness of the Green River Formation in this area of Utah. 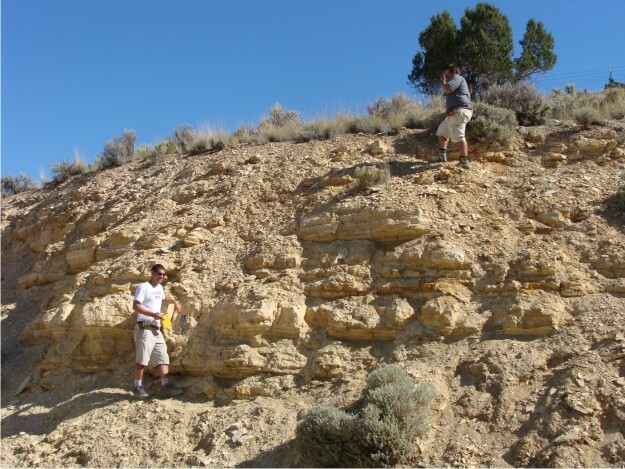 Surprisingly, though, we couldn't find as many tuff beds in this succession as we did farther north near Ephraim, Utah. This is a view of the Green River at the mouth of Twist Gulch, a small canyon just to the N of Soldier Canyon. 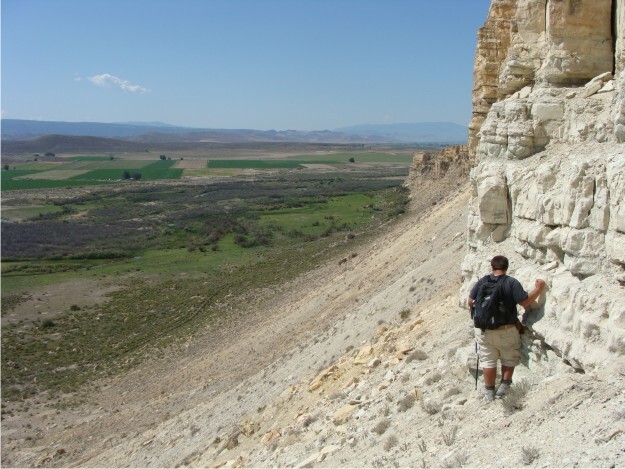 After a quick visit here, we decided to travel northwards toward Gunnison, Utah, to visit the Chalk Hills. 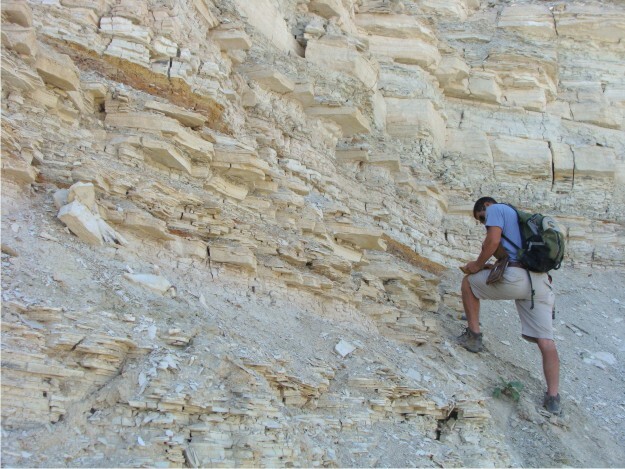 After a reconnaissance to the Chalk Hills one day, we decided to come back the next day to investigate the stratigraphy and possible presence of tuff beds. The Chalk Hills were quite interesting and possibly could form the basis for another Wooster I.S. in upcoming field seasons. The view from the base of the Upper Member of the Green River at the Chalk Hills was spetacular, even if the climb up and down was a little treacherous! White Hill, north of Ephraim, Utah. Research Day 7 (July 16). We returned to White Hill for our last day of work at this location. Today’s task was to measure a 362 ft stratigraphic column through part of the Lower Member and all of the exposed Upper Member of the Green River Formation. That’s a lot of limestone!! This was an important day, because this stratigraphic column will allow us to correlated all of our other stratigraphic columns by finding numerous other tuff beds in the Lower and Upper Members. View of a portion of our 362 ft stratigraphic column of White Hill. Phil and Bill, nearly at the top of White Hill, are discussing their measuring strategy. The guys are excited that they've finished their stratigraphic column at White Hill. 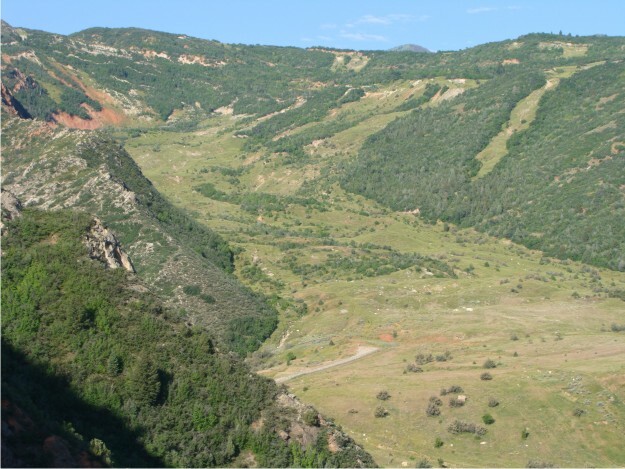 In the background are several other features: Black Hill is the smaller cuesta just behind their heads, while the Wasatch Plateau rises to its 10,000 ft elevation.